It’s finally here! The Holiday Decluttering Challenge starts today!! I’m so excited to finally spill all the details on our new decluttering challenge. 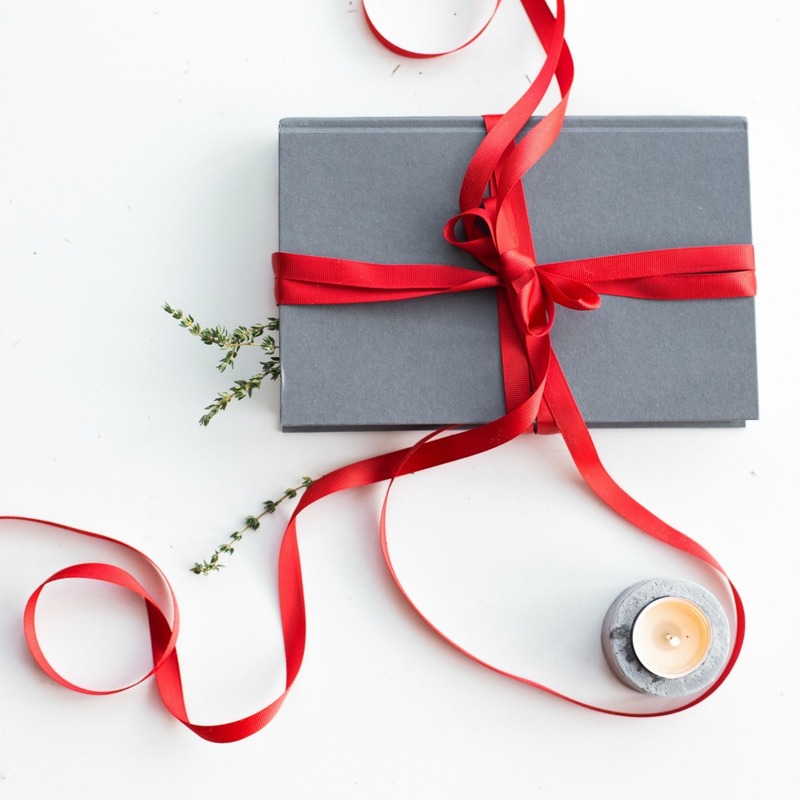 This post contains affiliate links, which means if you make a purchase after clicking on a link I may make a small commission, at no additional charge to you. Thank you so much for your support! I wanted to do a holiday decluttering challenge for a couple of reasons. First and foremost, my own home is feeling pretty out of control lately, and the idea of bringing more stuff into this house next month is completely overwhelming me! It’s also been way too long since we did a challenge together as a group. 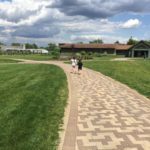 I know I always get more done when I’m held accountable by other people so I’ll be sharing regular updates on Facebook, in the Declutterathon group, Instagram, and YouTube as well as weekly progress updates right here on the blog. Are you sick of me yet?! Most of all, I’m looking forward to seeing your updates! I can’t wait to see how much progress you make over the next four weeks. This challenge is going to be a little different from the usual decluttering challenges because we’re going to focus more on our mindset and thoughts while dealing with our stuff. You are welcome to do as much or as little as you’d like. If I suggest doing something that doesn’t interest you, skip it! 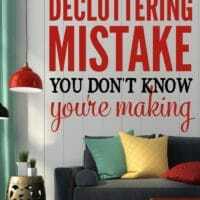 If you want to declutter a different area or more than is suggested for that day, go for it! This is your challenge. Please feel free to adjust as necessary to make it work for your life. 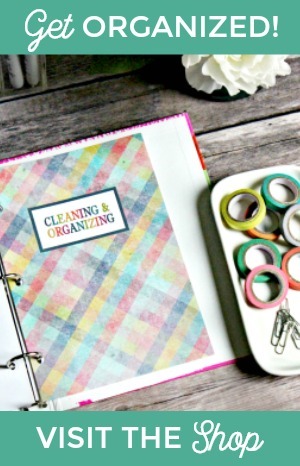 I thought the best place to begin would be with a little self-reflection to figure out why we have clutter so the second page of our pretty printable workbook (the cover is the first) is a short questionnaire. and,ultimately, why we want to declutter. Earlier this year, I saw a Simon Sinek’s TedTalk, which is all about why some businesses succeed and others, that seem to have everything going for them, fail. The answer is that successful people and businesses Start with Why. If we keep our reason for decluttering and a vision for what we’re working for in the forefront of our minds, it’ll help us move through those hard moments. In moments of overwhelm or weakness when we don’t feel like decluttering or we’re questioning if keeping a few more things “just in case” is really that big of a deal, we can tap into our why. If our actions aren’t in line with our goal and desired vision for our home, we need to rethink what we’re doing. Next is the “reversing negative thoughts” page. I hope you won’t need this, but if you’re anything like me, you probably will. I can’t even count how many times I’ve silently called myself a slob, said I was lazy, and berated myself for not being a better housekeeper. Clutter can make us feel extremely guilty, but that guilt doesn’t help. Can you imagine trying to run a marathon with someone running next to you screaming what a lazy and out of shape mess of a person you are? How motivated would you be to continue? I can guarantee I’d want to give up pretty much immediately, but that’s exactly what we do to ourselves while decluttering. We need to treat ourselves like we would the people we most cherish so page three is all about paying attention to the negative thoughts that cross our minds and turning those thoughts around. For example, instead of beating myself down with thoughts like, “You’re a complete slob!” I’m going to focus instead on saying, “You are making wonderful progress with each moment you spend decluttering.” I know this may sound silly to some, but I promise that the more intentional we are in choosing our thoughts, the better our lives will be. 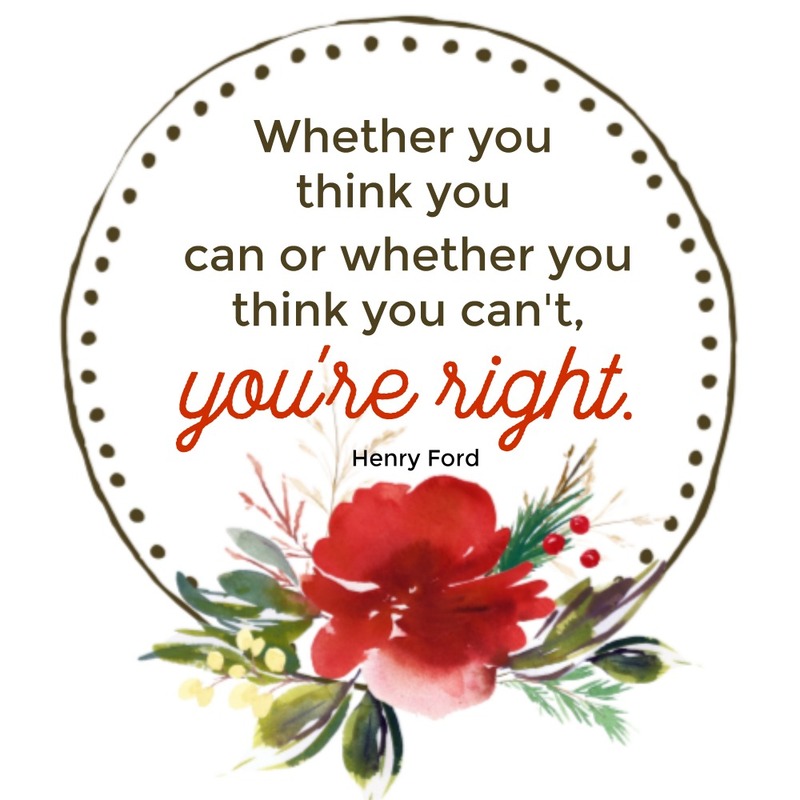 I really think that the gratitude, affirmations, and positive self talk portions of this challenge are vital to making progress. Honestly, if I had to choose between you getting rid of things and just doing daily affirmations and expressing gratitude, I’d choose the gratitude and affirmations every single time, and here’s why… I believe that whatever we want to achieve in life has to first be believed as being possible in our hearts and minds. If we don’t think we can do something, it really doesn’t matter how hard we work; we’ll never achieve it. We have believe it’s possible first. Pages five, six, and seven are different monthly planners. Personally, I’ll probably be using page five (with the standard calendar view) and tackling the spaces in my life and home according to the schedule written out on page seven. Pages five and six don’t have specific areas or items listed because I wanted you to be able to personalize this plan. 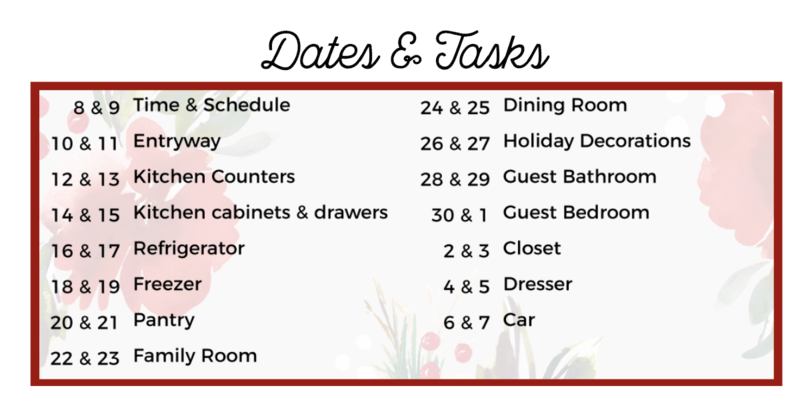 I’ve arranged the days based on the areas of my home (and life) that I would like to have tidied before Thanksgiving and Christmas, and you’re welcome to follow the same schedule or create your own. On the bottom of pages five, six, and seven is a “habit tracker.” I highly recommend you keep track of the daily habits you’re trying to cultivate. Giving yourself a check mark or coloring in a box will show you how well you’re doing and what, if anything, needs to change. I’ll be sharing the specifics of my own challenge and daily habits in a video (ahh!!!) very soon. To be honest, I’ve been working so hard on getting all of this together that I haven’t had the chance to really figure out exactly what those new daily habits are going to be. 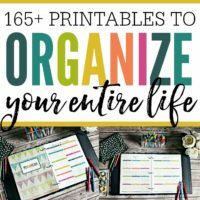 The last page is a list of 50 things you can declutter quickly. I’ve included this for those moments when you’re feeling overwhelmed and don’t know where to start. I frequently jump into decluttering with a lot of energy and excitement only to end up feeling overwhelmed and like I’m spinning in circles. 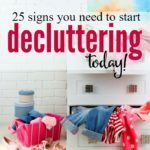 I hope this list helps to give you ideas on what you can declutter if you happen to feel the same way. Whew! Longest… post… ever, right?! Long story short (bahaha! 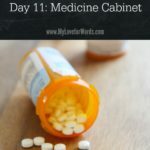 I couldn’t resist after writing a 1220+ word post! 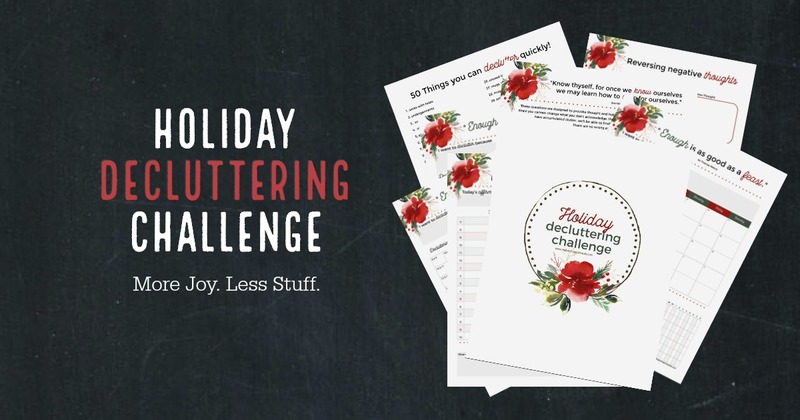 ), I hope you enjoy this challenge and it helps you have a less cluttered and more joyful holiday season. 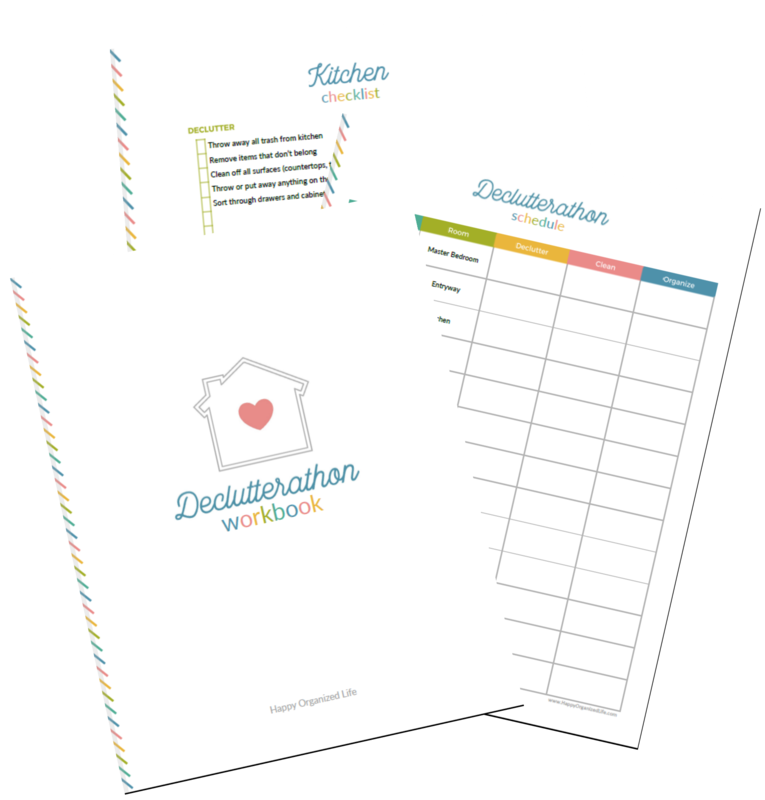 Don’t forget to join the Declutterathon group on facebook so you can share your progress as well as give and get support, and to grab your free printable workbook below. 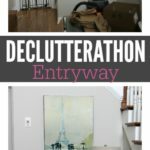 Let’s make this the best decluttering challenge ever and end 2017 with a bang!! 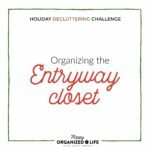 31 Days of Decluttering: Day 11 Declutterathon: Entryway Before and After Entryway Closet Organization (2018 Holiday Decluttering Challenge Day 2) 25 Signs you Need to Start Decluttering Today New Decluttering Challenge, Soul Decluttering! i sent my email address and have not received the confirm again Emily! Oh no! Definitely check your junk folder. It may be hiding in there. I don’t see it in the free printable library. Am I missing something? I haven’t had a chance to add it yet. Sorry! ???? Clutter is so demoralizing, and I can’t wait to get started! I’m already a subscriber, but I can’t see how to log in to access the free printable library. Never showed up, spam either. 🙁 Any tips? I was already signed up but re entered by email above to get this guide. Maybe I confused it? Oh no! I don’t know what’s going on. I’m just going to email the link to you directly so you don’t have to wait any longer. Thanks so much for reaching out and your patience with the tech hiccups! Oh no! I’m sorry to hear that Sarah. Please email me at emily@myloveforwords.com with the email address you subscribed with and what you’ve tried/where you’re running into trouble, and I’ll see what I can do to help. I am a subscriber but I can’t access the printables. I guess I don’t have the correct password. Also, I subscribed with an alternate email just to see if I could access the printables and I never received a confirmation. I have checked all my folders. 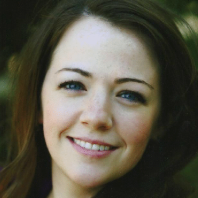 Hi Joy, please email me at emily@myloveforwords.com with the email address you subscribed with, and I’ll look into what’s going on. Thanks! Emily can you please make sure that I’m back on your email list. If you have done decluttering in the laundry room, can you send me the blog or steps you took. Hi Mary, I just checked, and it looks like you’re not on the list. The good news is there’s an easy fix! Just subscribe in any of the sign up boxes on my blog (they’re usually at the top or bottom of the page), and you’ll be able to receive newsletters again! 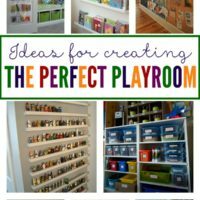 🙂 As for the laundry room, I’ve shared some a couple posts that might interest you: Creative Laundry Room Organization (https://www.happyorganizedlife.com/creative-laundry-room-organization) and Laundry Room Decluttering (https://www.happyorganizedlife.com/declutterathon-laundry-room/). I’m sure more will be on their way soon too! Thanks so much for asking. I hope that helps!! Need help with decluttering my laundry room, any help.